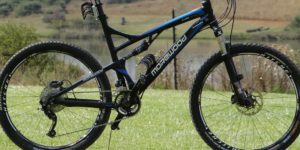 Part 2 of the mountain bike buyers guide are tips for buying a mountain bike which help to understand the components of mountain bike. 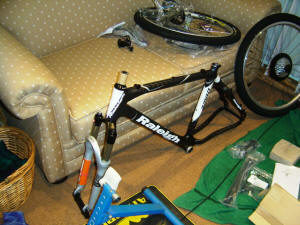 The bike brand essentially relates to the frame, because that is all that the manufacturer actually makes. So consider material and construction, weight and warranty, backup and availability. Most top brand frames are equally strong and offer a breakage warranty. However how quickly and how prepared they are to honour the warranty will vary. Full suspension is the way to go for anyone serious about riding. The only reasons to go hard tail are an entry level buyer with limited budget, a weight weenie race snake or you are a purist who likes the feel of a hard tail. Other than that everybody will benefit from full suspension. Improved comfort and handling are the major benefits. Components are everything except the frame. There is a fixed pool of components that most manufacturers make use of. So essentially they all use the same components in varying combinations. The low end components are only suitable for occasional use. The mid to high end components typically offer good value for money. The top of the range is the most expensive, the lightest and best quality but not always the most durable. The components are groupsets (cranks, gears and brakes), fork, wheels, shock, and then the controls like bars, stems, seats and pedals. This consists of crank, bottom bracket, front derailleur, rear derailleur, cluster or cassette, brake/gear levers, cables, calipers and chain. Few complete bikes actually come with a full group set. Manufacturers mix and match for what ever reason but usually to save costs. You will need to know what group set it is and where it fits into the range, check the table below. Your best bet is to compare and focus on the major components (crank, front & rear derailleur) but don’t loose sight of the other components. 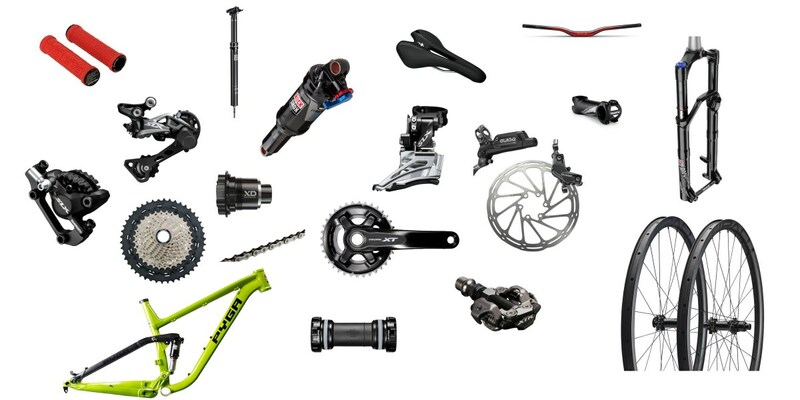 There are two major manufacturers who dominate groupsets, Shimano (Japan) and SRAM(USA). The sequence used to be quite simple with 3×9 gears, 3 chain rings on front and 9 gears on the rear cassette. But then MTB innovation happened and it went to 2×10 then 1×11 and now 1×12, all of these are still available. The group sets are ordered in descending quality, price and performance. The hierarchy goes from the top, Pro (lightest strong efficient), Expert (light strong durable), Sport (Strong reliable), Recreational and lastly entry level at bottom. This hierarchy applies not only to the gears but also brakes and hubs in the case of Shimano. The fork or front shock is one of the most important parts of a mountain bike. The front shock can make or break a bike spec. Major manufacturers are Fox and Rockshox, find out where it fits into the brand range to understand its performance. Know what features it has like air assisted, rebound adjustment, lockout, stable platform valve, travel adjustment etc. These are made up of the rims, spokes, hubs and tyres. Tubed or tubeless rims will be your starting point for comparison and then strength, stiffness and weight are key factors in choosing wheels. A good set of wheels makes does make a difference to the performance, feel and handling of the bike. Top end wheels are carbon, offering lower weight and increased stiffness. This refers to the rear shock on a full suspension bike. Manufacturers have a variety of brands with different performance levels and with different features. Similar to the front shock there are things like lockout, air assisted and sensitivity settings. Disc brakes are now standard on most bikes except lower end bikes. They offer significantly better braking ability and control. Cable discs offer some improvement over v-brakes but it is the hydraulic versions that offer the full benefits. These include the bar, stem, headset, seat, seat post and pedals. These can round a bike off or leave you with future upgrade options. On lower end bikes try to get the best components that you can afford and on higher end bikes they become a matter of individual preference. How to buy a mountain bike describes different types of riding and the bikes best suited. History of mountain bike technology describes some of the advancements and differences in frames, brakes, suspension, wheels and drivetrains.